Usually when I do these Monday Morning roundups in La Liga, I put together some quotes from the Madrid dailies, because well their frankly more entertaining, but after Madrid came back and beat Sevilla while Barcelona were drawing to Almeria in a disputed match away from home, I decided to catch what the reaction was in Catalunya. 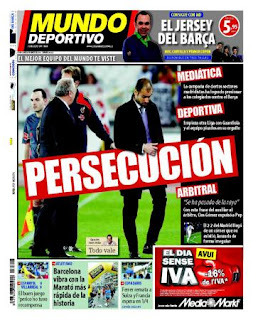 Barcelona: Persecution: Mass Media: the persecution of Barça knows no end. The campaign by some sectors of madridistas has managed to pressure the refs against Barca. Sporting: Another League begins with Guardiola and the clubs pride is wounded. Refereeing: Hes crossed the line. With that phrase alone, from the linesman to referee Clos Gomez, they gave Pep the expulsion. Real Madrid: The 2-2 from Madrid came from a corner that did not exist and was taken in an irregular manner. Espanyol 0 – 0 Villarreal: The fine play by the Pericos had no compensation. Reaction: Only in Madrid could you get a score draw to Barca and a late comeback after falling behind at home and turn it into winning the league and singing oe, oe campeones in the stands with 13 weeks left in the season. I wouldnt put too much to the Villarato calls on either side but the refs are clearly being more critical of Barca than they were allowed last year and frankly thats the real point of Villarato: a manufactured controversy made to put pressure on the refs. Of course, Barca have their own propaganda tools as we see here. Frankly, a pox on both their houses I say. Thats why I support Espanyol. Messi: is the leader to follow: through talent, but also through attitude, he always pulls the team. Espanyol 0 – 0 Villarreal: Espanyol’s goal drought continues. El Mundo Deportivo is highly unprofessional, talk about the thieves talking about thievery! There have been MANY accounts where Barcelona have been favored this season, I could point them out but I dont want to dig that grave!